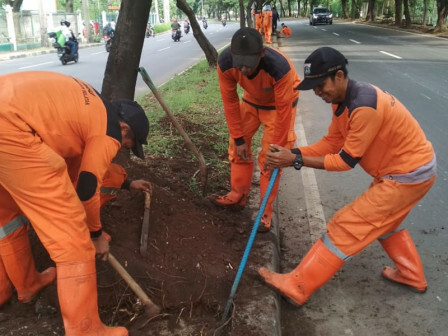 Ten of Public Facility Maintenance Agency (PPSU) personnel under Kembangan Selatan Urban Village, Kembangan Sub-district, West Jakarta are alerted to handle puddles during rain season.
" We do this as early handling to flow puddles onto the channel"
Kembangan Selatan Urban Village Head, Marullah said that team will conduct sweeping puddles on streets and fallen trees during rain, as puddles are often seen around Kembangan outer ring toll road due to low road position and no channels. "We do this as early handling to flow puddles onto the channel," he stated, Monday (1/28). That is by making a water reservoir in a small park area to flow puddles around the toll road," he said. Similar condition is also spotted behind Hypermart due to channel covered by collapse the cable windings. “We’ve been coordinating with related units for handling utility network behind hypermart,” he told. When there is no rain, personnel routinely conduct cleaning on some streets to optimize water flow. "They also pick up garbage in the channel," he told.